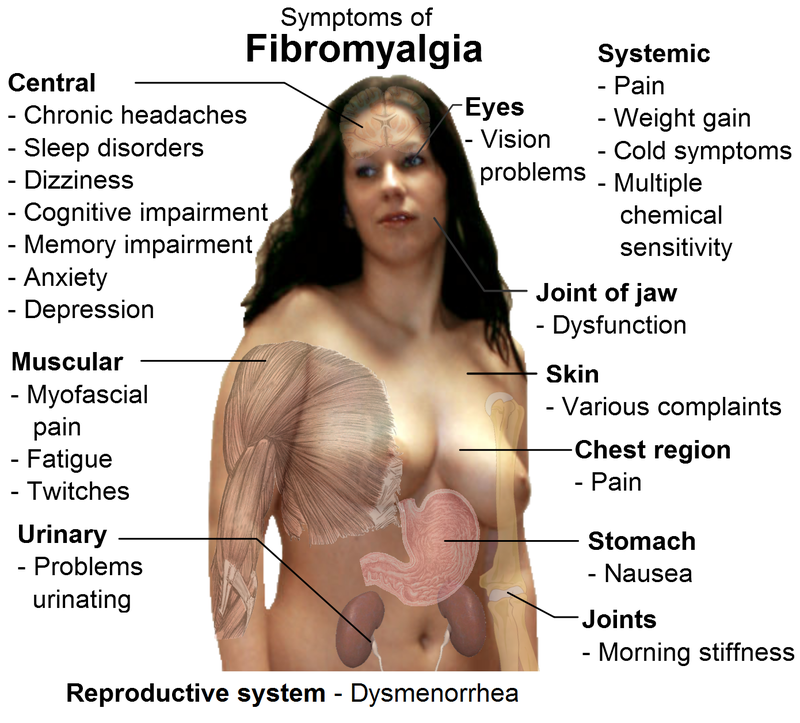 Are you frustrated by your Fibromyalgia symptoms? Widespread Pain – People describe the pain as deep muscular aching, throbbing, shooting, stabbing, or intense burning. Stiffness is usually worse in the morning, and muscle groups that are used the most may hurt more.1 In addition, the severity of regional pains can make your fibromyalgia worse. Regional Muscle Aches – The muscles particularly in the head, neck, shoulders and lower back areas may feel tight, knotted and rope-like with firm knots that hurt. The knots are myofascial trigger points and more information on them is provided in the section on Diagnosis. Fatigue – This symptom can be one of the most incapacitating. Patients may feel as though their arms and legs are weighted down by concrete blocks and their bodies may be so drained of energy that every task is an effort. Sleep Disorders – Patients often have trouble sleeping through the night and waking up unrefreshed. Repeat arousals prevent you from reaching deep, restorative sleep, so you wake up feeling as though you have been hit by a Mack truck. An overnight sleep study may show repeat arousals, but a specific sleep disorder may not be found. Note: If you can relate to these symptoms, enter your e-mail address on the box to the left to receive a free feature article on sleep treatments. Do loud sounds, bright lights, or odors bother you? Does your skin burn? These symptoms could be connected to your fibro, read more. Memory and Concentration – Difficulty concentrating and retaining new information may seriously interfere with everyday mental tasks. This symptom is referred to as “fibro fog” and patients are easily distracted, which hinders learning and memory tasks. Exercise Difficulties – Exercise fails to activate the body’s natural pain-relieving system, so overdoing it can make your fibromyalgia symptoms worse.8 You might try mild exercises done in short intervals (such as five minutes at a time) and alternating this with rest periods to help you stay fit. A study in Sweden revealed that half of the fibromyalgia patients found it difficult to climb stairs and most could not run. Irritable Bowel – Constipation, diarrhea, frequent abdominal pain and bloating, abdominal gas, and nausea represent symptoms commonly found in roughly 40 to 70 percent of fibromyalgia patients. Chronic Headaches – Recurrent migraine or tension headaches are experienced by 50 to 70 percent of fibromyalgia patients. Most headaches are rated as severe, occur at least two times per week, and often have a migraine component. The source of this head pain is most often from myofascial trigger points in the shoulder, neck, and head muscles. Jaw Pain – Temporomandibular joint dysfunction causes tremendous jaw-related face and head pain. It affects three-quarters of fibromyalgia patients and is typically related to the muscles in the area and not necessarily the joint itself.